For Beth Mettes, happiness is found in the country, with fresh air, plenty of acreage and beloved animals surrounding her. A circulating nurse in the operating room of University Hospital’s Level 1 Trauma Center, she lives on a farm in northeast Missouri with her husband, Tyler; two Labrador retrievers; goats; horses; chickens; and a wild bunch of barn cats. Although Beth, who earned her BSN from Blessing-Rieman College of Nursing in Quincy, Illinois, commutes to Columbia for work from her home in Macon, Missouri, she was searching for a graduate nursing program she could complete from home on her days off. And thanks to the Doctor of Nursing Practice program at MU’s Sinclair School of Nursing, she’s found that living and serving the community she loves while pursuing graduate education are in no way mutually exclusive. 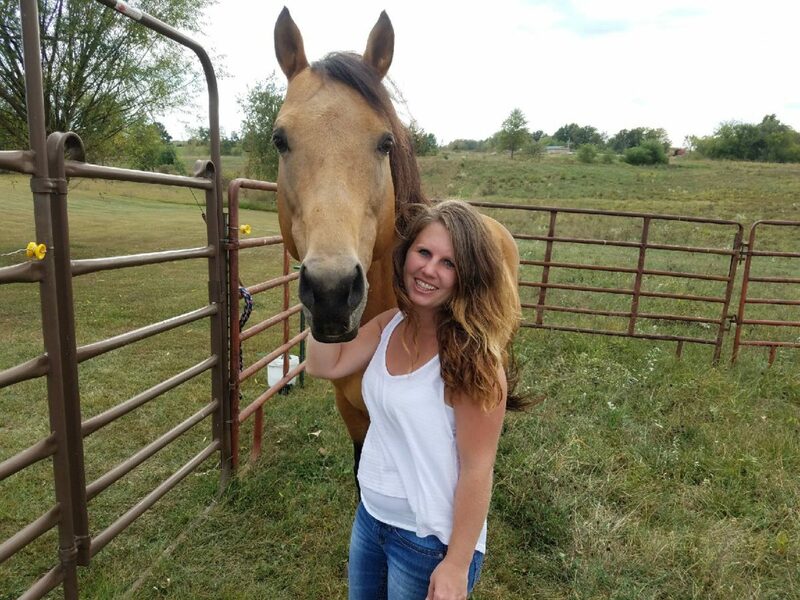 There’s serenity to Beth’s life on the farm that helps balance her nursing job at MU, where her 12-hour shifts begin bright and early at 6:30 a.m.
For Beth, it’s the variety of procedures and various surgeons that keep her job interesting. In addition to her full-time nursing job in the operating room, last spring Beth took a second job as a mental health clinical instructor for SSON undergraduate nursing students. Because of the flexibility of the DNP program, Beth’s graduate courses have fit seamlessly into an already-full schedule. And although the days can be long with so much to juggle, Beth says the online capabilities of the program have proved invaluable in allowing her not only to achieve her goals but also to connect with a variety of instructors with diverse backgrounds and specialties. With her May 2018 graduation date quickly approaching, Beth is preparing to transition to being a nurse practitioner, providing primary care for patients of all ages. Demand for nurses with her qualifications is high, particularly in rural settings. For Beth, serving the needs of her small town is about more than just providing health care — it’s about continuing her family’s long line of service and giving back to the community that raised her. Beth’s mother provided for the family and community by selling crop insurance to local farmers, and her father, a rural electric cooperative’s lead lineman, provides electricity to the community. “I want to be part of continuing to provide much-needed services to our area by returning to the region as a nurse practitioner,” Beth says. “There is a need for providers to fill a service in rural areas, and because I grew up appreciating a rustic life, I am incredibly interesting in the peacefulness of remaining in the rural environment. There is an unexplainable calmness of sitting by a fire and listening to the crickets and coyotes. Click here for more on the Sinclair School of Nursing’s DNP program, including entry pathways and areas of study.